Photo featured on OSA’s web page! 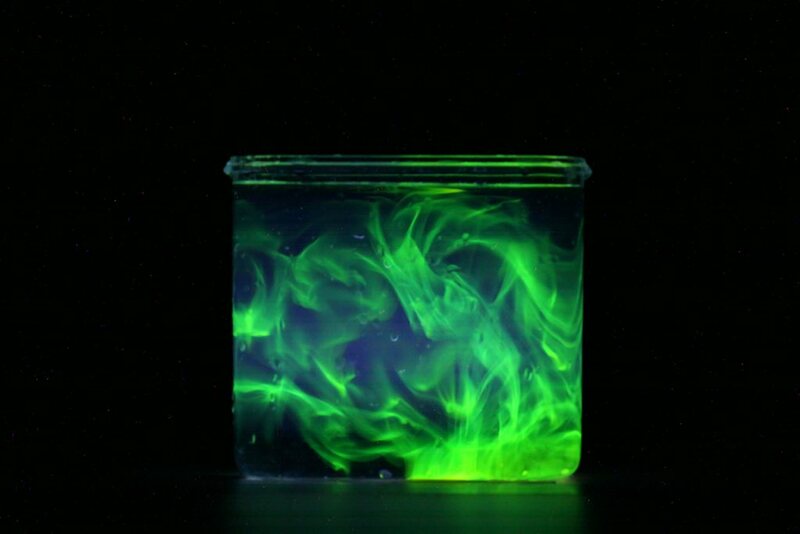 Check out the photo on the OSA’s website, and be sure to comment and share! Located on the second floor of the Dartmouth Hitchcock Medical Center (DHMC), the Advanced Imaging Center houses several imaging devices used by the Optics in Medicine Laboratory. 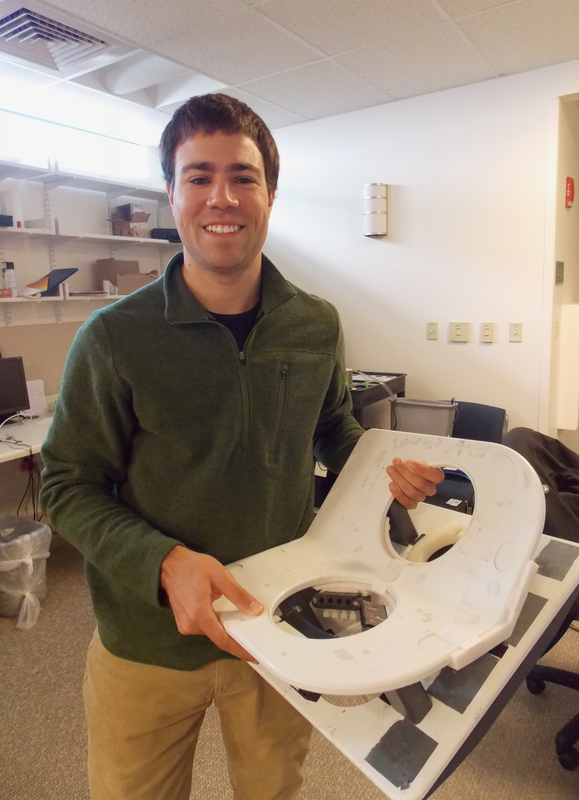 Currently, graduate student Michael Mastanduno is testing a prototype that combines Magnetic Resonance Imaging (MRI) with Optical Tomography into a singular imaging device. This has the potential to significantly improve the accuracy of non-invasive breast-cancer imaging, leading to better patient care. 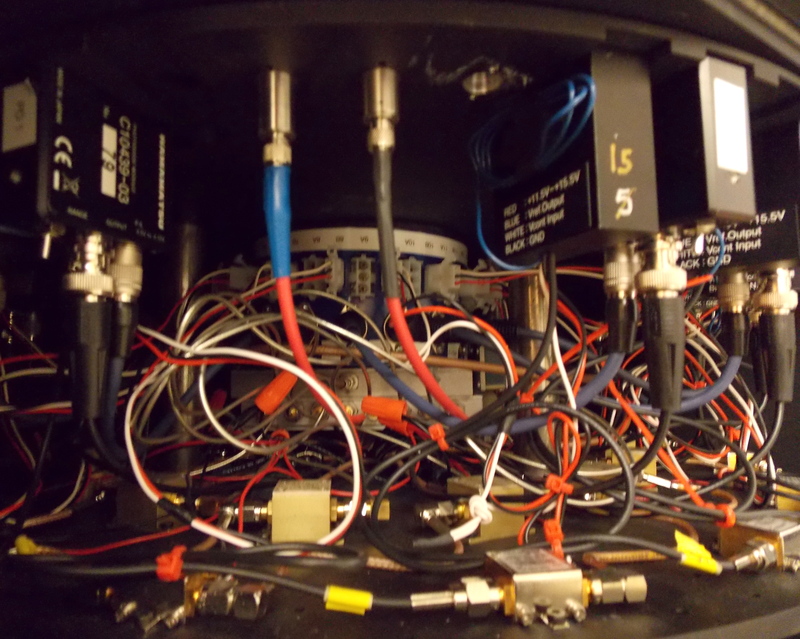 This summer, graduate student Fadi El-Ghussein started working on and upgrade to this system’s instrumentation. 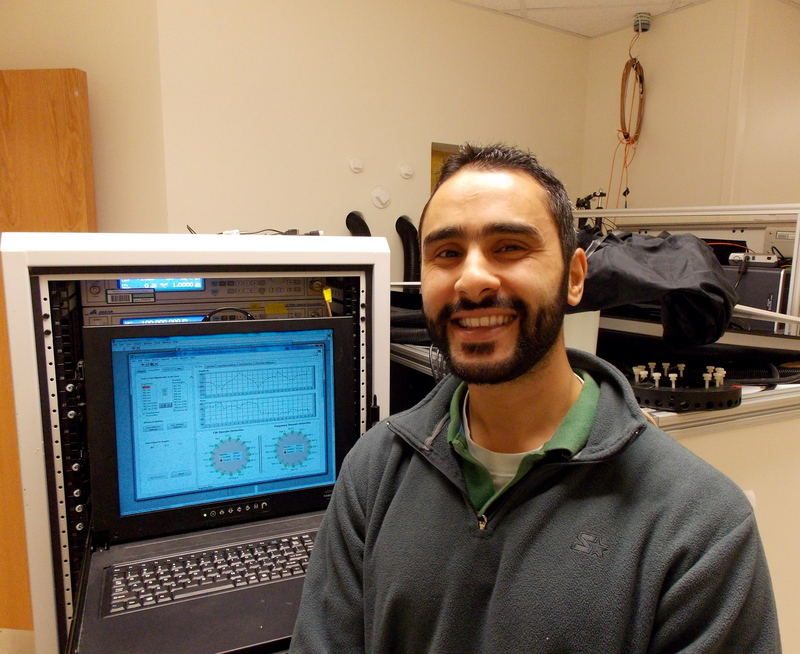 El-Ghussein’s input enabled the research team to finalize a prototype of this non-invasive imaging machine and to begin testing it on humans in a clinical setting. To expedite the testing process, the research team is moving the imaging system to Xijing Military Hospital in Xi’an, China for two months with Associate Professor Shudong Jiang. “Due to our remote location in the Upper Valley, we’re only able to image a small number of patients each year,” explains Mastanduno. “However, in Xi’an, our team will be able to test the imaging machine on two patients a day. Hopefully, the images gathered by our team in the Xi’an clinical tests will provide the data necessary to have the efficacy of the technology fully evaluated by 2012. The instrumentation built by El-Ghussein enables the imaging machine to deliver optical light to the MRI scanner, and then to collect this data from either a tissue phantom, or a patient. While the components used by El-Ghussein to build this device are commonplace in clinical imaging systems, this machine is unique in that it allows both the MRI scanner and the machine’s optical components to independently collect data, and then feeds this information into a computer where it is mathematically reconstructed into a detailed 3D model. To enable the imaging system to simultaneously collect MRI and tomographic data, Mastanduno engineered the machine’s cradle so that its optical fibers connect directly with the patient’s skin. Housed beneath the MRI’s breast coil, this cradle guides the fiber optic cables to the patient’s breast, and once each cable is firmly connected with the organ’s surface, the machine starts to collect imaging data. Tomographic imaging creates three-dimensional models of breast cancer that supplement the information provided by mammograms, a breast cancer screening method commonly used in hospitals. 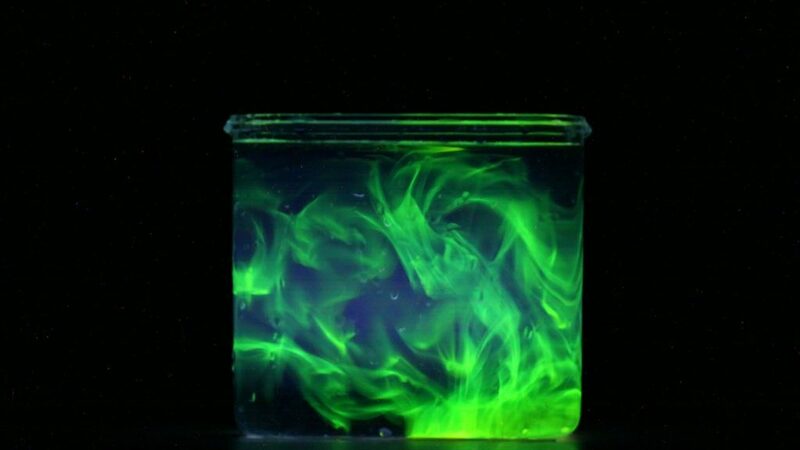 Currently, the Optics in Medicine Laboratory is researching a number of methods to improve these imaging techniques, and is developing medical devices that integrate tomographic imaging with other tumor-modeling techniques. This July, Professor Keith Paulsen acquired both 2D and 3D microwave tomographic images of calcaneus bones in two patients. This study, which was conducted with seven other medical researchers, compared the data gathered through microwave tomographic imaging against x-ray density measurements. The team observed a good correlation between the data gathered from the two imaging systems. The study represents the first clinical examples of microwave images taken of the calcaneus, as well as some of the first successful 3D tomographic images taken of a human anatomic site in a clinical setting. Published by the Dartmouth Hitchcock Medical Center earlier this month, Dr. Steven Poplack explains the benefits of tomosythesis mammography in this video. Though Dr. Poplack is not directly affiliated with the Optics in Medicine Lab, his explanation of tomosythesis mammography relates to the research conducted by Professor Paulsen. The Optics and Medicine Laboratory would like to welcome its newest graduate student, Yan Zhao, to Hanover. Originally from Xuchang, China, Yan received his bachelors degree in engineering from Xian Jiaotong University. While at Jiaotong, Yan published a paper titled “Polarization dressings of four-wave mixing process in a V-type three-level atomic system” in Optics Communications. Published with a number of other students, this paper examines the interplay of four coexisting four-wave mixing (FWM) signals and focuses on how these waves act in atomic systems. This is Yan’s first time coming to the United States. After landing in New York, Yan traveled to Hanover via coach, and started moving into his new office in Thayer. So far, he finds New Hampshire “amazing and interesting” and looks forward to meeting other incoming graduate students. Outside the lab Yan plays tennis and badminton, and enjoys reading science fiction novels. Welcome to the lab, Yan! Kenneth Tichauer, a third-year Research Associate in the Optics in Medicine Laboratory, was awarded a Postdoctoral Fellowship by the Canadian Institutes of Health Research (CIHR) during the 2011-12 academic year. Ken’s research project, Imaging HER2 receptor binding in breast during the course of therapy with dual-agent fluorescence, was ranked 3rd out of the 400 applicants who applied for the funding opportunity. Ken received his bachelors of science in Biophysics from the University of British Columbia (UBC), and his PhD in Medical Biophysics from the University of Western Ontario (UWO). The research fellowship of $100,000, which is distributed over a two year period, has allowed Ken to develop a non-invasive method for measuring the distribution of human epidermal growth factor receptor 2 (HER2)—an important molecular target in breast cancer therapy—across the tissue of a tumor. Prior research has connected both the aggressiveness of a breast cancer tumor and its resistance to chemotherapy to the concentration of HER2 in vivo, but the biopsies used to measure the concentration of HER2 only sampled a small section of these tumors. The CIHR Postdoctoral fellowship is now allowing Ken to map the distribution of HER2 across breast cancer tumors using fluorescence molecular imaging. Currently, Ken is expanding the methodology that he developed in his examination of HER2 in breast cancer to develop a method to non-invasively determine metastatic tumor burden in sentinel lymph nodes. Ken hopes that his application of this methodology will one day yield a non-invasive test using fluorescent imaging to optically examine a lymph node and determine whether it contains cancerous cells before removing it surgically. Scattered light measured from tissue can be uniquely correlated to tissue substructure, function and progression of disease. The ultrastructural information provided by scatter may render optical techniques valuable to diagnosis. Many recent studies have demonstrated that scattered light measured from tissue can be uniquely correlated to tissue substructure, function and progression of disease, if the wavelength dependence of the light is obtained at each pixel. This is because the morphologic changes associated with cancer progression cause organelle and structural matrix alteration, which can be observed macroscopically as local fluctuations in the optical refractive index (RI). These changes include hyper-proliferation of epithelium, nuclear crowding and enlargement, as well as intracellular organelle changes and sub-cellular stromal matrix alteration. Therefore, it is quite reasonable to assume that the ultrastructural information provided by scatter may render optical techniques valuable to diagnosis; the limiting factor being our lack of knowledge about how light scatters through heterogeneous tissues. Extracting information from scatter spectra requires an ability to reasonably model the behavior of light as it passes through a tissue. This is a rather convoluted problem because it is difficult to separate light that has weakly scattered from that which has multiply scattered, in addition the effects of absorption and scatter are intermingled. To circumvent this complication, optical constraints are applied to limit detected photons to those primarily experiencing a single elastic collision. A raster scanning reflectance spectroscopy imaging system is used to characterize fresh, excised tumors and normal specimens with 100 micron spatial resolution (approximately one mean free scattering path length in tissue). This system was designed to sample the scatter directly, allowing empirical separation of the absorption and scattering effects. 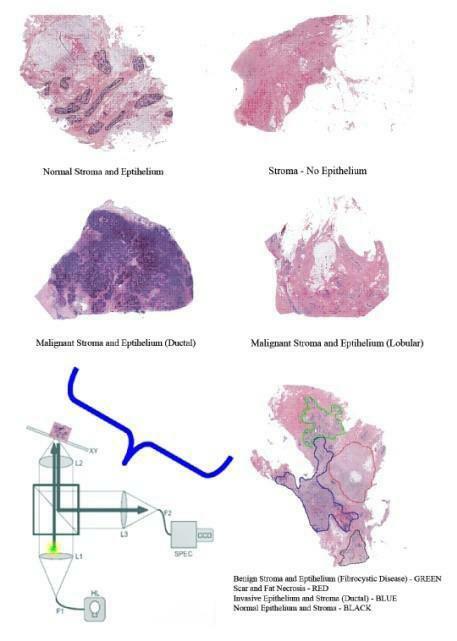 Scatter measures are then elucidated with pathology so that diagnostic categories of breast tissue may be optically characterized for a classification algorithm. To enhance the diagnostic utility of our system, we are also using electron microscopy to visualize individual, sub-wavelength scatterers to better understand how the distribution of small scatterers in the extra-cellular matrix influences optical signals. The focus of this analysis is on collagen fibers because scattering from epithelial cells is well approximated by Mie theory and little is known about collagen, a dominant, non-spherical scatterer. Understanding light-tissue interactions at the microscopic level will improve models of light propagation through breast tissue and consequently data parameterization.